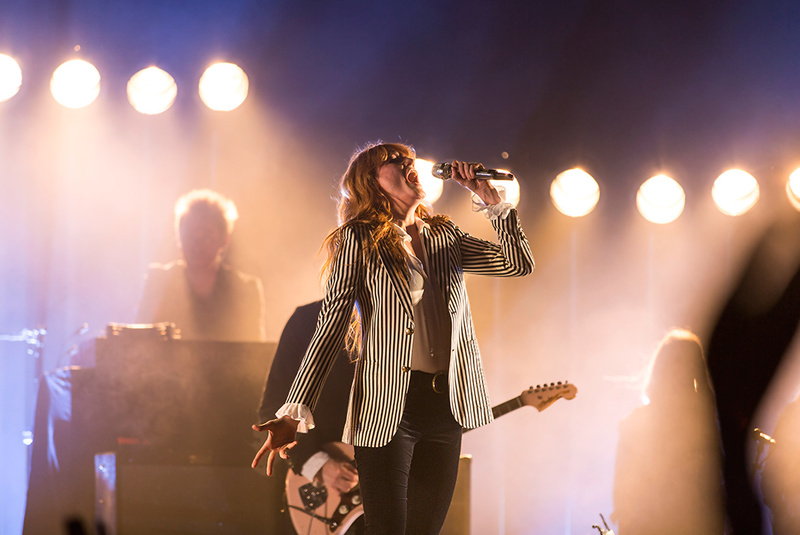 Florence and The Machine kicked off their latest tour with two nights at the Masonic Temple in San Francisco, ahead of the release of their upcoming third record, How Big, How Blue, How Beautiful. On night one, April 8th, Florence emerged in a fetching velvet suit and loose scarf/tie that would make Patti Smith jealous. But she quickly shed the jacket to reveal a much more Florence Welch-y shirt with her signature billowy wizard sleeves, leaving one to wonder just how the heck she managed to get that much sleeve volume inside the tight-fitting velvet blazer in the first place. Of course, all wardrobe questions were soon pushed away by the sheer force of Florence’s voice, as she tore through the 10-song setlist before the three-song encore. Prior to playing the title track from How Big, How Blue, How Beautiful, she explained that the song and record name were inspired by the skies of America, and how they inspired a sense of magic and optimism, as well as a relationship she was in at the time that subsequently fell apart throughout the rest of the record. During the final pre-encore song, “Dog Days Are Over,” she encouraged the crowd to, as usual, jump on cue. To aid in her jumping she took of her shoes and socks and encouraged others to do the same. Thankfully, no one took her up on it. One audience member in the front row did Florence’s clothes-shedding example to the natural next step and flung her bra onstage. As the packed crowd went wild jumping up and down, balcony collapse was a mild if real fear in the newly renovated auditorium. Night two saw Florence once again sporting a blazer and pants, this time a Beetlejuice-esque striped number over her velvet pants. Once again, she shed the blazer after a few songs, this time revealing a sheer, billowy pirate-shirt that really caught the wind as she bounded from one side of the stage to the other and broke out in limb-flailing dances. Florence apparently used to tell people she was a practicing witch, and after seeing her moves (coupled with her almost supernatural voice) you can excuse anyone who believed her.